Attention: This article is a stub because Para is lacking knowledge! You can help the Len'en Wiki by expanding it with more knowledge! Kunimitsu Ooya (大宅　都光, Ooya Kunimitsu) is a human that works as a professional youkai exterminator for the current emperor. They are also the stage 3 boss of the Brilliant route of Brilliant Pagoda or Haze Castle. Kunimitsu is a professional youkai exterminator. Using their sword, they can sheath and unsheathe their sword with lightning speed, even despite the blade's long length. They are clearly not an amateur by any measure. Kunimitsu wields the Bankuruwase -DaviD- (Japanese: 番狂 —DaviD—), which is a long sword that grows in power whenever it cuts an opponent more powerful than its wielder. The sword's sheath has a predominantly white design with some blue parts, since the sword was never shown unsheathed, it is unknow how the sword itself looks like. According to JynX, it was created by Yago Ametsukana. Kunimitsu was childhood friends with Fujiwara no Iyozane and Ooama no Ake no Mitori, until Iyozane was killed and poisoned by Mitori. 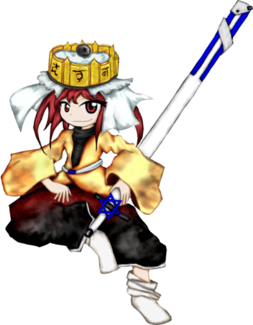 Meanwhile, Kunimitsu gained fame because of their sword skills and youkai extermination, so they were hired by Mitori to help them with numerous favors, such as exterminating youkai and the assassination of the emperor. Kunimitsu is based on Ooya Tarou Mitsukuni (大宅太郎光圀), a samurai appearing in the legend of Takiyasha-hime (depicted in these pieces). Following the death of Taira no Masakado, Tarou Mitsukuni confronted Masakado's daughter Takiyasha-hime in the ruins of the old Sōma palace, where she summoned a gashadokuro to attack him. Their full name is Kunimitsu Ooya (大宅　都光). "Ooya," a common Japanese family name, means "large manor." "Kunimitsu" is composed of kanji meaning "capital city" and "light." Both their first name and surname are derived from Ooya Tarou Mitsukuni (大宅太郎光圀). Kunimitsu has short red hair and red eyes. They wear a black turtleneck under orange clothing and a black hakama. On their head is a golden crown with a frilled veil, which is actually the crown of the Emperor of the Capital City. They carry a long blue sword called Bankuruwase. Their pose is based on that of Ooya Tarou Mitsukuni in this woodblock print. Upon realizing that they weren't related to the emperor's family, Mitori organized a coup d 'etat to destroy the Fujiwara dynasty. Because of their long friendship, Kunimitsu agreed to help Mitori with the assassination. Since Mitori decided to throw away everything related to the Fujiwaras, they also discarded the crown, giving it to Kunimitsu. After Mitori became emperor, they ordered Kunimitsu to attack the Senri Shrine. Kunimitsu was on the way to go, where they're approached by the heroes. On the way towards the Capital City, Yabusame Houlen and company encounter Kunimitsu, who advises them to go home. Shion senses something bad coming from the crown Kunimitsu is using, since it reeks of fresh blood and it's apparently stolen. Kunimitsu says that they actually robbed it, but then changes it and says that the Emperor bestowed it upon them. Things only get worse when Tsubakura lets it slip that they're from the Senri Shrine. Apparently Tsurubami has a bad story in the Capital and by extension Kunimitsu, making them enemies. They settle it on danmaku duel and Kunimitsu loses. After Yabusame and company fly away, they find out that they want to resolve the incident because they believe it's going to rain sake. When flying towards the Capital City, Fumikado and their lackeys encounter Kunimitsu, an old friend of Iyozane. Having passed a long time, Kunimitsu doesn't recognize the boater. However, Fumikado recognizes that the headwear on Kunimitsu's head is the Emperor's crown, demanding where they found it. Kunimitsu claims that the current Emperor gave it to them, but Fumikado doesn't believe it because the Emperor would never pass it to someone not related by blood. In order to prove who is worthy of being the Emperor, they deal it with a danmaku duel. After being defeated, Kunimitsu mocks Fumikado for deluding themself into believing they are the true Emperor. Iyozane and Kunimitsu used to be friends in their youth, until Iyozane was killed and poisoned by Mitori. Kunimitsu never knew that Iyozane was revived until they met again during the events of Brilliant Pagoda or Haze Castle. While Kunimitsu was happy to see Iyozane was alive, they were upset that Iyozane was now allied to Fumikado, who is now a rogue fugitive from the Capital City. Apparently, Iyozane and Kunimitsu used to be so close that Iyozane called them by the pet name of Micchan (みっちゃん, Micchan). They were childhood friends and both were close to Iyozane. Mitori is appreciative of Kunimitsu's swordsmanship and cooking skill and while Kunimitsu refused to become an exterminator for the empire, they often accept Mitori's favors since they know each other. Apparently, Kunimitsu was an accomplice in the emperor's assassination. Kunimitsu despises Tsurubami and holds a grudge to the shrine and its priest because Mitori deemed the shrine as an "unnecessary presence". This page was last edited on 16 February 2019, at 10:40.